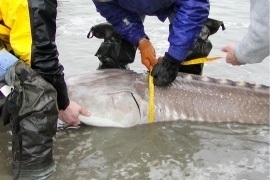 Your participation in our Sturgeon Conservation catch tag and release Challenge event supports the Fraser River Sturgeon Conservation Society’s award-winning, volunteer driven, monitoring and assessment program and our continued efforts to understand, protect and restore this ancient species. You will be collecting critical research data with each sturgeon you encounter. for more information about the FRSCS Sturgeon Conservation Challenge, donations and sponsorship, please contact John Rissling, Director at john@frasersturgeon.com or Tyler Thibault, Volunteer Coordinator, tyler@frasersturgeon,com.